Liverpudlian music journalist Lily McCain has special powers she really wishes would go away. One touch of someone else’s skin and she can see into their future – often as far as their death. As a result she has reached adulthood alone and unhappy with no one to turn to and no reason for her being set apart from humanity in this way. Then one night an encounter at a gig with a stranger as tall and handsome as he is mysterious and irritating sets in motion a chain of events that not only offer her an explanation but also could be of vital importance when it comes to the future of humanity. It’s not every day that a young woman discovers she’s a goddess. 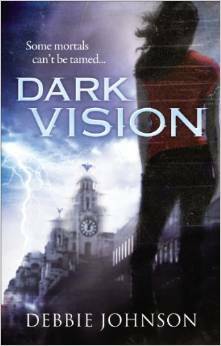 One of the main strengths of Dark Vision – and the one that will keep drawing the reader in – is the characterisation of the cynical protagonist, Lily. While many teenagers always suspect that they’re different and special, the teenage Lily was one young woman who had always known she was and furthermore would have given anything to live a normal life. The novel is set during her twenties by which time she regularly uses humour and sarcasm as a shield against the misfortune that life continues to throw her way. Smart and sceptical, she is easy for the reader to identify with and furthermore – for all her faults – root for throughout. Besides her reactions to the increasingly out of this world shenanigans she finds herself surrounded by as the story progresses are very convincingly drawn with the result that the reader has no difficulty accepting them without the need to suspend too much disbelief. 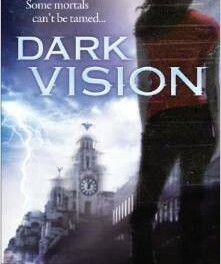 The use of modern Liverpool as a backdrop plus the pop-culture references that pepper Lily’s thoughts and speech all combine to make this a particularly convincing urban fantasy. Another strength of the novel is the cast of weird and wonderful characters that surround and interact with Lily. They are all well drawn and diverse and have a depth of inner life and background that make it very easy to imagine them carrying on their business outside the confines of the story. Special mention should be made of Lily’s best friend Carmel whose journey as the novel progresses is in many ways as impressive as Lily’s own. The paranormal fantasy background is largely drawn from Celtic mythology but contains enough of other elements to make it unique. Despite this not being a novel about the misunderstood undead, the coven of vampires that play a central role in Dark Vision are just at home there as the Irish deities and demigods and work very well in the context. An enjoyable fast paced paranormal adventure containing both comedy and tragedy, which leaves the reader looking forward to a possible sequel.